The Brighton, Hove and District Bugle Band owes it’s existence, thanks to the dream of our late President, Derek Ford. It came about as a direct result of the lack of Company bands within our Battalion. This was highlighted when Brighton hosted the Brigade Council and we had to turn to our friends from the London District to fill our short fall. So Derek , along with Mick Baker, ex 13th, decided that Stedfast could try and rectify the problem. This was in the later part of 2000. So in January 2001 the prospective drummers met to practice, this was followed in the February, when I, along with the likes of Richard Hawes, Brian White attended the first combined practice for both Drums and Bugles. Derek remained the driving force for our band, becoming our co-ordinator, administrator and band master, a post he held for a few years. In that time he put us in contact with our, now friends from the London District. When Derek stood down, he handed the reins over to Mick Baker, who ran the band for the next few years, before standing down and handed things over to Paul Simmons. Our London band, formed before us, was the “brain child” of David Kemp, a very experienced bandsman from London, who later on became our National Co-ordinator, bringing in bands and players from around the country. Today, the band draws it’s members, both male and female, from England, Wales, Scotland and even Germany. 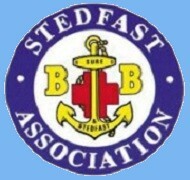 The National Stedfast Band is now co-ordinated by Paul Hern. Like David and Derek, Paul in very focused and has organised our practices around the country, mainly at Felden Lodge,(Our Brigade National Headquarters , but also RAF Halton and Kneller Hall, home of the Royal School of Military Music. The combined band has played all over the UK including The Lord Mayors Show in London, Edinbrugh and also the Republic of Ireland, Dublin. In 2014 a large part of our band will be travelling to Flanders to play at Ypres to mark to start of the Centenary of the start of the First World War. On a local front, Paul Simmons runs our local band with the help of Brian White, our local band master. We meet and practice on the first Friday of the month at our home, Southwick Methodist Church Hall, and we meet at 7pm. Instruments are provided and we desperately need more members so why not come along and join our happy , friendly band of players. If you would like to join the band please contact Paul through the Committee by e-mailing committee@brightonstedfast.org.uk, also please visit the Bugle and Drums Band website for dates of when the band will be performing.